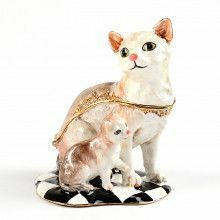 This kitten trinket box is just the cutest. It is cast from pewter, and hand-painted with a thick enamel-like paint. The cat features a gold plated bowtie, and a gold plated base. This kitty box features several hand-set shimmering Swarovski crystals. The box opens and closes with a magnetic clasp. This kitten comes complete with a gift box.